WesMar: Aromas that Dance in the Glass Aubin Cellars has Verve A Short History of Pinot Noir in North America: The Formative Years 1850-1989 Small Sips of Russian River Valley Pinot More Sips of California Pinot Don Sebastiani & Sons Branching Out Pinot Briefs Book Review: Is This Bottle Corked? 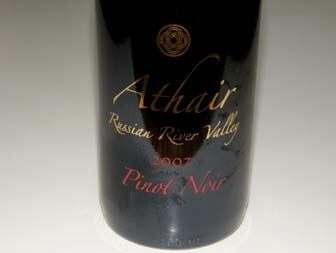 Athair Wines Athair means “father” in Irish Gaelic. The label is a collaboration between Tom Keith and his son-in-law, Jim McMahon. McMahon learned his winemaking at Kenwood Winery in Sonoma Valley, and subsequently at Luna Vineyards in Napa Valley where he is currently the assistant winemaker. Jim McMahon crafts this wine in memory of the fathers in his life. Visit the website at www.athairwine.com. 14.7% alc., 725 cases, $36, unreleased. Grapes sourced from Calegari Vineyard on Eastside Road and Lowe Vineyard on River Road. Aged in 30% new and 70% neutral French oak barrels. · Complex and appealing nose featuring aromas of Bing cherries, cardamon spice, a hint of oak, and a little good funkiness. Cherry-driven with an underpinning of cola and spice with a memorable persistence of cherry fruit on the finish. Nicely put together and a pleasure to drink. Very good. Dehlinger Winery In a recent issue of the PinotFile, I featured an in-depth story on Dehlinger which included a vertical tasting of Dehlinger Estate Russian River Valley Pinot Noir from 1996 to 2006. Since that review, I was able to locate the 1997 vintage which was missing from the vertical. 14.5% alc., 1,300 cases, $35. · Still bright in color. Lovely scents of black cherries, cedar, old oak and prominent spice. A well-structured and thoroughly delicious wine that is surprisingly fresh for its age. Rich and satisfying flavors of black raspberries, cherries, grilled fruit, charred wood and brown spice are framed by soft tannins and bright acidity. This wine has character and staying power. It will last several more years. Who says California Pinot Noir can’t age? The Donum Estate The Donum Estate is devoted to a single Carneros estate Pinot Noir and a Russian River Valley estate Pinot Noir. 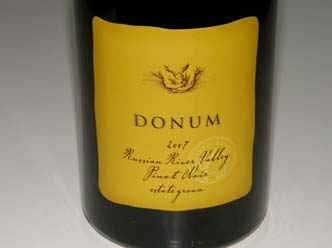 The name Donum translates from the Latin to “gift,” and refers to grapes as a gift of the land. Winegrower and President, Anne Moller-Racke, was the vineyard manager for Buena Vista Carneros for many years and played an instrumental role in obtaining appellation status for Carneros and the formation of the Carneros Quality Alliance. With the sale of Buena Vista to Allied Domecq in 2001, the Racke family of Germany split off 200 acres of the Buena Vista Estate to form The Donum Estate as well as to grow grapes for the revived Robert Stemmler label. The consulting winemaker for The Donum Estate and Robert Stemmler is talented Kenneth Juhasz (his own label is Auteur) and the assistant winemaker is John Harley. The Russian River Valley bottling comes from the 11-acre Nugent Vineyard which is farmed by the Donum Estate. 14.5% alc., 200 cases, $65. Inaugural Russian River Valley release. Remarkably long 130 day hang time. 100% de-stemmed. 5-day cold soak, native fermentation, aged on lees for 11 months in 75% new French oak. · Dark reddish-purple color. The aromas of black cherries, black raspberries and woodshed draw you in. Very tasty raspberry and blackberry attack with a hint of cola and brown spice. A charming wine that has aged beautifully. Nicely proportioned, soft in the mouth with supple tannins. Perfect now. Very good. 14.4% alc., $65. 95% de-stemmed. 5-day cold soak. Native fermentation. Aged on the lees 11 months in 75% new French oak. · Aromas of black cherries, plums, wildflowers, oak and a slight green note. Well-endowed core of blue and black fruit with accents of earth, mocha and cola. Robust and succulent but well defined by balancing soft tannins and lithe acidity. Pretty good but not exceptional. Very good (-). 14.4% alc., pH 3.69, 500 cases, $65. 40% 667 and 60% 115. 95% de-stemmed. 5 to 10 day cold soak, native fermentation, 1 week extended maceration, aged on lees 11 months in 75% new French oak. No press wine incorporated into the blend. Unfined and unfiltered. (Label says 100% Carneros fruit from Donum Estate - obviously an error). · Dark reddish-purple color. Very lovely black cherry and blackberry aromas that are heady and penetrating. Full-bodied, almost syrupy, with endless dark Pinot fruit. Unusually dark for Russian River Valley stock. Still backward and linear without nuance but definitely has impressive stuffing. 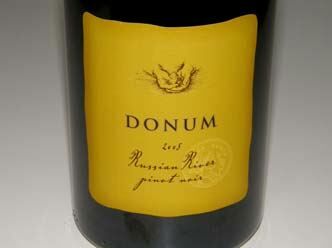 The best Donum Russian River bottling to date. Put this one in the cellar. Very good. Dutton Estate WineryThis winery specializes in vineyard-designated Pinot Noir, Chardonnay, Syrah and Sauvignon Blanc from the Dutton family’s estate vineyards at Dutton Ranch in the Green Valley, Russian River Valley and Sonoma Coast appellations. Established in 1995 by Tracy and Joe Dutton as Sebastopol Vineyards, winemaker Mat Gustafson crafts the Dutton Estate wines as well as those released under the Sebastopol Vineyards label which are a broader representation of the appellations. Gustafson has been the winemaker since 2002. The Dutton Ranch was founded in 1964 by noted Sonoma County viticulturist Warren Dutton. Today, Dutton Ranch farms 1150 acres of grapes and 150 acres of apples. The wines are available on the website at www.duttonestate.com and through retailer www.klwines.com. A 2007 Manzana Vineyard Pinot Noir and 2007 Jewell Block Pinot Noir are also available. 14.5% alc., 275 cases, $45. · Lovely aroma of fresh cherry tart. Red cherry and berry fruit is front and center with a touch of earthiness. Very supple in the mouth with well-concealed tannins and impeccable balance. More finesse and less persistence than the Karmen Isabella bottling, but very satisfying in its own right. Very good. 14.9% alc., 625 cases, $37. 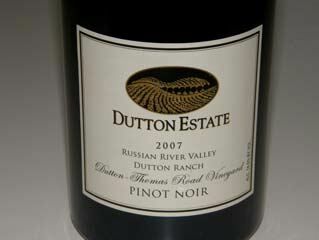 Composed of fruit from three selected vineyards at Dutton Ranch in the Green Valley of Russian River Valley. · Stunning aromas of fresh Bing cherries and strawberries. Luscious core of cherries, strawberries and cassis create a rich and vivid middle palate. All silk and satin in texture with alcohol providing a sweet plushness. A hedonistic Pinot Noir that will please lovers of virile fruit. I usually go for a lighter touch, but this one really grabbed my attention. 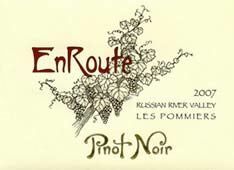 EnRoute The Nickel Family (Far Niente, Dolce and Nickel & Nickel) has entered the Pinot game with the release of the 2007 EnRoute Les Pommiers Russian River Pinot Noir. Nickel & Nickel has quietly been producing a string of vineyard-designated Pinot Noirs in small quantities from the Dutton Ranch’s Manzana Vineyard and Spring Hill Vineyard in Petaluma. The success of these wines led to the establishment of a new label and winery exclusively devoted to Pinot Noir. The partners bought an old apple orchard and planted 21.5 acres to clones 115, 777, Pommard 5, Mt. Eden, Swan, and 2A (christened the Graton Vineyard), and acquired the 22-acre Amber Ridge Vineyard which is composed of clones 115, 667, 777, Pommard 5. The 2007 EnRoute Pinot Noir was primarily sourced from Manzana Vineyard, but beginning in 2008, the EnRoute Pinot Noir was sourced from the two estate vineyards and a small amount of Manzana Vineyard. The winemaker is Andrew Delos, a former assistant winemaker at Nickel & Nickel who previously worked with Russian River Valley fruit at Pellegrini Family Vineyards. Until a new winery is built, the EnRoute Pinot Noir is being produced in another winery facility in Graton. The winery’s art deco label is among the smartest labels I have ever seen. The EnRoute wines are highly allocated to a mailing list with limited restaurant and retail distribution. To acquire, visit the website at www.enroutewinery.com. 14.4% alc., 1,200 cases, $50. This wine is named for the apple orchards that once flourished in the Russian River Valley. Primarily Manzana Vineyard fruit, clones 114, 115 and Pommard 5 with a small amount of Sonoma Coast fruit. · Terrific nose showing off hi-pitched aromas of Bing cherries and raspberries with hints of oak-induced vanilla and spice. In the mouth, this wine has that lush cherry fruit the Russian River Valley is so noted for augmented by notes of cola and brown spices. The tannins are ripe and supple, and the smooth texture is captivating. An impressive debut that delivers a panoply of Pinot pleasure. Gary Farrell Vineyards & Winery This winery still carries noted winemaker Gary Farrell’s name, but he has left to pursue his own label (Alysian). The winery is now owned by Ascentia Wine Estates. The picturesque winery is located on Westside Road, the Rodeo Drive of Pinot Noir, perched on a hillside overlooking the Russian River Valley. Winemaker Susan Reed was picked by Gary Farrell to continue his tradition of winemaking and the winery has maintained access to superb fruit sources in the Russian River Valley. 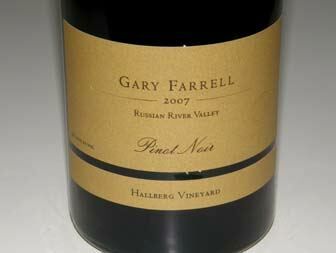 The single vineyard and Russian River Valley Selection Pinot Noirs and Chardonnays are sold on the website at www.garyfarrellwines.com. 14.2% alc., pH 3.32, 6,677 cases, $32. Barrel fermented in 100% French oak barrels (33% new) for 7 months. · Straw colored. Scents of pear, melon and restrained oak. Moderately rich flavors of apple, pear, lemon and the slightest oak. Smooth and very slightly viscous with a nice grip of acidity. Decent (+). Porter Creek Vineyards Porter Creek has a long history in the Russian River Valley, dating to 1977 when George Davis bought 40 acres of land adjacent Porter Creek on Westside Road. Porter Creek is one of the major tributaries to the Russian River. 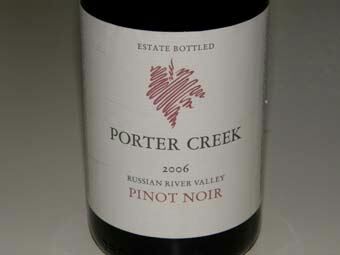 Porter Creek Burgundian and Rhone wines developed a loyal cult following over the years, but the winery has never achieved notoriety. The estate is planted to both Pinot Noir and Chardonnay. George Davis made the wines from 1982 until 1997, when his son, Alex Davis, took on that role. Alex has a degree in enology from California State University at Fresno and spent several years in France at such renowned wineries as Christophe Roumier, Bernard Michelot and Marcel Guigal. All estate vineyards are certified organic and in transition to Demeter biodynamic certification. The winemaking style employs natural fermentation exclusively, discreet use of new oak for elevage, and an emphasis on channeling terroir into the finished wines. The wines are sold through a mailing list and direct inquiry (707-433-6321, wwwportercreekvineyards.com). 14.3% alc., $32. · Intriguing notes of cherries, brier, sage, sawdust and oak on the nose. Earth-kissed black cherry core with grippy tannins that currently overwhelm the fruit. Improves in the glass over time indicating that decanting or further aging is advised. Hard to put my finger on it, but this wine just doesn’t excite now. Decent (+). Sequana Vineyards Industry veteran Tom Selfridge recruited winemaker James MacPhail (MacPhail Family Wines) to create a new winery sourcing grapes from the Green Valley of Russian River Valley and the Santa Lucia Highlands. 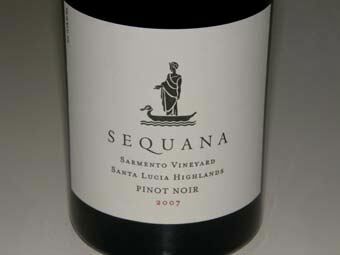 Sequana is the Franco-Roman goddess of the River Seine which flows through the ancestral birthplace of Pinot Noir. MacPhail, who mentored under Gary Farrell and Merry Edwards in the 1990s, handles all the viticulture duties as well. 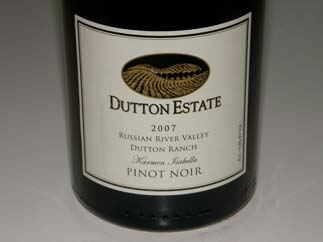 Three Pinot Noirs were released in 2007 (the Dutton Ranch Pinot Noir is not reviewed here). The wines are crafted in the same style as MacPhail Family Wines showing fruit-driven flavors, generous alcohols and well-extracted and well-structured body. 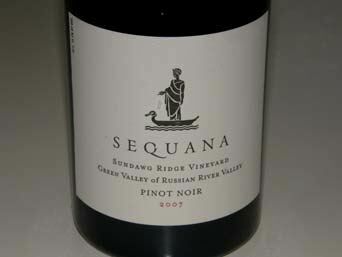 The Pinot Noirs are sold on the website at www.sequanavineyards.com and through limited retail distribution. Impressive website. 15.1% alc., pH 3.58, $50. This vineyard is planted in Goldridge soils over marine sedimentary sandstone and the site is heavily influenced by morning and evening fog. After cold soak, the grapes were fermented in small, open-top tanks using primarily native yeast. Hand punch downs. Aged on the lees in 40% new French oak for 11 months. · Leads off with aromas of black cherries, oak and mint. Dark cherries and berries are featured on the well-endowed palate with accents of earth, cola and oak. The fruit is encased in healthy, ripe tannins. The alcohol is well-integrated. May warrant a better rating in a year or two. Decent (+). 14.8% alc., pH 3.82, $32. · Winemaking regimen same as for Sundawg Ridge bottling. Heavily oaked fruit with an underpinning of earth and herbs on both the nose and palate. Smoothly textured with restrained tannins and a dry finish which leaves an unpleasant oak tug. Decent. Tandem Greg La Follette is an icon among California winemaker circles. Educated at University of California Davis, he trained under wine masters such as Tchelistcheff and Kongsgaard and was one of the first winemakers bringing attention to the “true” Sonoma Coast (at Flowers). He has consulted on numerous new winery launches including Londer Vineyards and James Ball Vineyards, both in the Anderson Valley, and has contributed his expertise on the international stage as well. La Follette was recently the consulting winemaker at De Loach Vineyards. He has designed and redesigned fourteen wineries worldwide and was the consulting winemaker for the new University of California Davis teaching winery. His own Tandem label sources from vineyards that represent long-standing relationships. La Follette helped plant Keefer Ranch Vineyard when he was the winemaker at Hartford Court. He provided much of the bud wood for Van der Kamp Vineyard in Sonoma Mountain. La Follette has a long standing relationship with Sangiacomo vineyards. He was the first to recognize the potential of Ritchie Vineyard when he first brought grapes into Flowers several years ago. Recently, he has developed an interest in the Manchester Ridge AVA of Mendocino County. His style tends to be big and bold with wines that are well-oaked and initially tannic. They benefit from some cellar time after release. The wines are currently vinified in Sebastopol at the former Vacu-Dry apple processing plant. Tandem wines are available on the website at www.tandemwines.com and through retail distribution. 15.1% alc., pH 3.69, 184 cases, $54. Entirely from Mariafeld clone (UCD 23). Aged 11 months in 40% new French oak. · Moderately deep garnet color. Oak char is prominent on the nose and obscures the underlying fruit. A well-endowed, generously extracted wine with a thick core of dark stone fruits, blackberries, beef and tar. Plenty of tannin still to shed. The alcohol is well hidden. The finish leaves an oak hangover. Will improve with time in the cellar, but will always be an oaky wine. Decent (-). Commentary: It should be noted that in a recent Wine Spectator article, wine critic James Laube talked about the trend in California Pinot Noir to “pulling back with more modest alcohols.” Although this may be a perceived trend, my experience, as demonstrated by the wines above and others in the section to follow, is that there are still many Pinot Noirs in the marketplace with high alcohols, dark color, high extraction, and plenty of oak.